ANNOUNCER: Gone is Fish Fish Fish on Sixth, and in its place is another burger concept from the owners of Shake Shake Shake. Dutch and Jackie head down the Ave to get their hands on a burger made from fresh beef. DUTCH: Not a lot of interior change happened from the fish concept, but then it didn't need much either. Retro chrome tables and bright colors now anchor a simple concept of just a few affordable burgers, fries and shakes. To add to the concept, 50's rock is played throughout the small space. JACKIE: When at full capacity it can feel snug in the intimate space, but I wouldn't let that dissuade you. The prices are killer and the grub is a palette pleaser for the whole family -- bring the kids! Their dogs are cross-cut and grilled making it easy to add your fixins evenly. There are corn dogs, too, which I didn't try but spied a couple kids devouring them, happily. It's the ultimate meal on a stick. DUTCH: I appreciate the limited menu with just a few burgers to choose from. 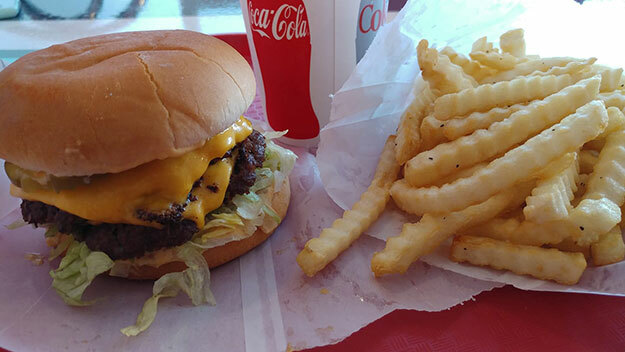 And with fresh beef on the grill, I opted for a double deluxe cheeseburger. Two patties with crisp edges are partnered with melted cheese and then finished off with fresh lettuce, onions, pickles and the house sweet sauce. The crinkle fries here are crispy on the outside and soft on the inside, and when dipped in either the house fry sauce or tarter, make for a hearty meal for just over $7. JACKIE: You can now add bacon to that double deluxe, which I did! If you prefer your bacon on the crisp side like I do, make sure to specify -- but the smoky salt from the bacon coupled with the sweet tang of their house sauce made this burger easy to conquer. DUTCH: If you want the full classic burger experience, then grab a milkshake in either chocolate, vanilla or fresh strawberry. The shakes are so thick, they come with a spoon rather than a straw, which is perfect if you like dipping your fries in your shake. And also, like everything else here, they are handmade to order. JACKIE: I'd love to come up with some Beefy's Burger jingle about affordable, bunned, beef patties and super thick shakes, but I'm not that clever. Instead, I'll just say give Beefy's a shot. You might just have found your new spot to get a fix.